Umbrella bamboo (Fargesia): growing, planting, caring. A bamboo that doesn't spread as much as other bamboos ! Fargesia is a genus of bamboos native primarily to China, with a few species in Vietnam and in the eastern Himalayas. Some species are cultivated as ornamentals, mainly Fargesia angustissima, the tallest species, and F. rufa, F murielae and F. nitida which are smaller. 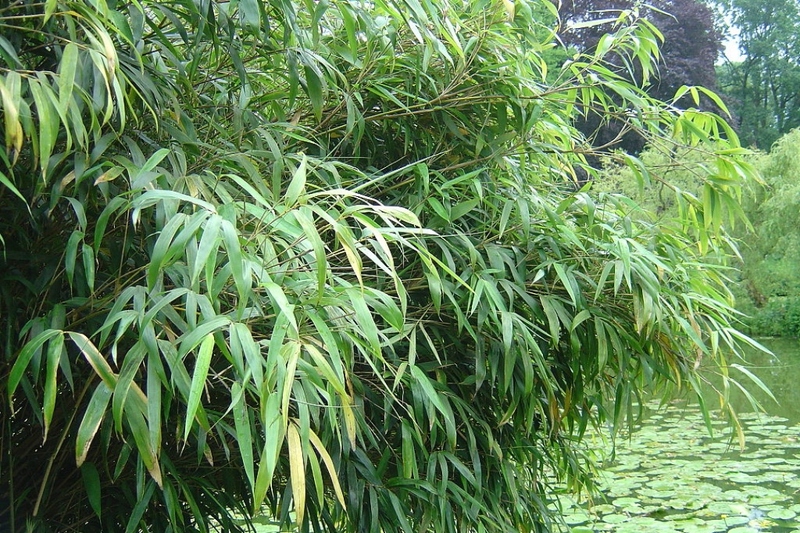 Fargesias are some of the world's hardiest bamboos, but they do not spread vigorously. Bamboos are orginally from Asia — it's the core of the pandas' diet! Their perfectly straight stalks and mostly narrow leaves make for perfect screening plants. All bamboos have underground stems that we call rhizomes. The rhizomes are the storage organs for the bamboo. The roots are called "adventitious" — meaning that they develop around the nodes of the rhizome. Fargesias are known as "pachymorphs", or "clumping roots", and won't spread. Bamboos love very sunny places and will accept practically any kind of soil — except dry! — with a slight preference for lightly acidic ground. If you plan to grow your bamboos in a pot, look for a pot or container that will be large enough, and mulch it heavily to keep the soil moist. Water regularly. Regularly watering your bamboo during the first two weeks after planting creates favourable conditions for root development and growth. Water your potted bamboo regularly, primarily during the evening, as it is a plant that takes in a lot of water, especially at the start. If needed, you can prune the height of your bamboo without difficulty — it won't harm the stability of the plant at all and will actually help it grow thicker. Just know that once they've been cut, the canes won't grow anymore — the secondary canes may regrow, but they'll never grow to the size of the original cane. On the other hand, the new canes will give you rhizomes! Propagate if you'd like in the spring. Dig out with a clean, preferably disinfected, garden spade, rhizomes at least two years of age, and if possible, choose plants that are not yet covered in hay mulch. Plant this rhizome in the ground, in a planter or in a pot with a mixture of garden soil and potting soil. Water copiously the first few weeks. Specific aphids, scales, mealybugs and mites target bamboo exclusively. Bamboo aphids are small, light-green, pear-shaped bugs that feed on the underside of the leaves, causing them to turn yellow and drop-off. Bamboo pit scales appear as tiny, black, oval bumps on the leaves and stalks of infested plants but cause no real damage. Bamboo mealybugs are small, oval, pinkish insects with a white waxy coating. Bamboo spider mites create veils of silky webbing on the underside of leaves. They feed by piercing leaf tissue, causing stippling and yellowing. Natural predators such as ladybugs, lacewings, predatory mites and parasitic wasps help prevent problematic infestations of bamboo insects and mites. If needed, spraying plants with a forceful blast of water or cutting off infested leaves helps control these pests. Insecticidal soap or horticultural oils may treat infestations. Mulch, at least for the first few years, in a way that protects your young plants from the winter cold, and also keeps the soil cool and moist. After a few years, spreading dried straw on the soil will create a natural carpet and you won't have any need to worry! Adding fertilizer will help promote vigorous growth and more vibrant leaves. In any case, if the leaves turn a light green or even yellow, it's time to add fertilizer ! Because bamboo is a member of the grass family, it consumes large amounts of Nitrogen. Fertilizers high in Nitrogen content will do, but any fertilizer meant for grass can also be used. The best time to apply fertilizer is during the shooting season : for most species this will be mid to late Spring.